Group portrait L-R: (seated:) Congressmen Paul Kilday, W.R. Poage, Wright Patman, Sen. Lyndon B. Johnson, Speaker Sam Rayburn, Sen. Ralph Yarborough, Congressmen George Mahon, Albert Thomas, O.C. Fisher; (standing) Congressmen Bob Casey, John Young, J.T. Rutherford, Jack Brooks, Frank Ikard, Homer Thornberry, Omar Burleson, Olin Teague, Clark Thompson, Walter Rogers, John Dowdy, Joe Kilgore, Jim Wright, Lindley Beckworth. 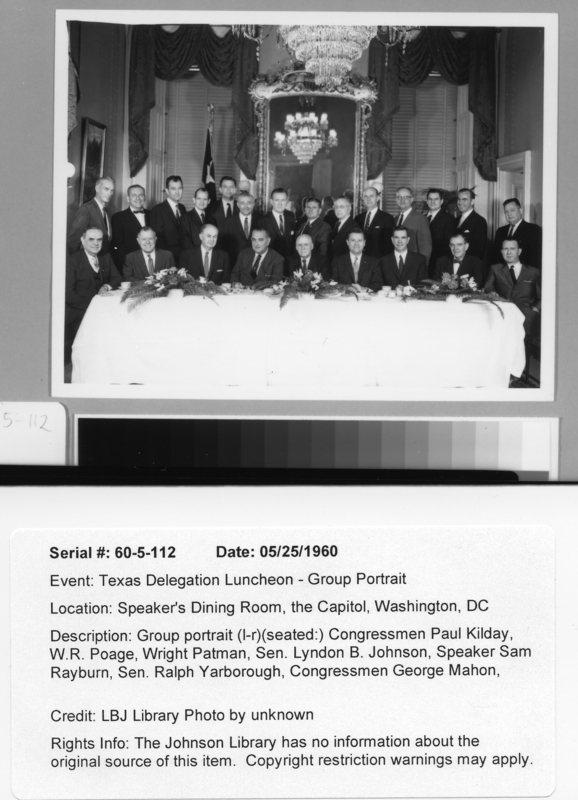 Texas Delegation Luncheon - Group Portrait, Speaker's Dining Room, the Capitol, Washington DC, 5/25/1960. Photo # 60-5-112.Pre-Presidential Photo Collection, LBJ Presidential Library. No source information available: copyright restrictions may apply.